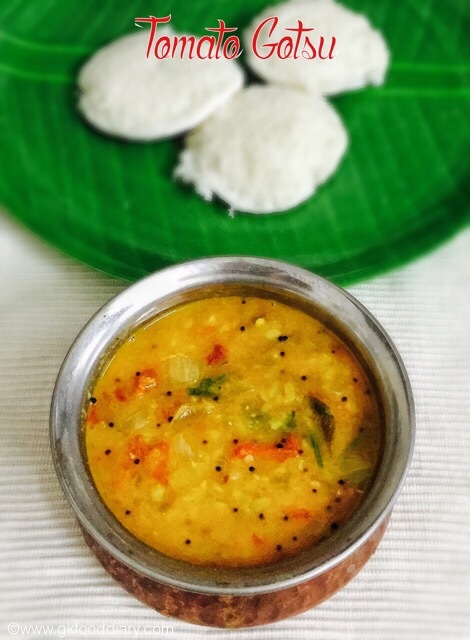 Tomato Gotsu- simple and quick Tomato gostu recipe for Idli or Dosa. Chop the onions and tomatoes finely. Split the green chillies. Keep everything ready. Pressure cook the moong dal for 3 whistles. Open the cooker once pressure released, mash the moong dal well. Set aside. Heat a pan with oil and add the items to temper. Once the mustard seeds cracks, urad dal turns brown, add curry leaves. Then add onions. Fry the onions till it becomes transparent. After that add the tomatoes in and sauté till it becomes mushy. Once the tomatoes turn mushy, add red chilli powder, turmeric powder and required salt. Mix well and add ¼ cup of water. Boil the gravy for 5 minutes or until the tomatoes are completely cooked. Then keep the flame low. Add the pressure cooked moong dal and mix well. Boil the gravy for 5 more minutes till the desired consistency is reached. Switch off the flame once done and garnish with chopped corainder leaves.